As the year draws closer to its frosty finale and weather reports of snow and freezing temperatures to come, our thoughts turn to keeping warm with woolly jumpers, thermal clothing and turning up the heating. One thing you don’t need to worry about with your Hymer is keeping warm because when it comes to ensuring your motorhome is ‘winterproof’, Hymer has done all the hard work for you. The motorhome experts have adopted some of the most forward-thinking concepts to create the winter-proof packages. 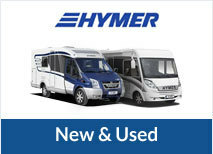 Hymer’s own bonding technology in the bodywork; a high quality heating and ventilation system, as well as the integral insulation concept are just a few of the ways in which winter issues have been addressed in the design. The heat insulation system also means you save on gas. As every Hymer leaves the factory, it comes complete with a suite of cold-curbing features, meaning you can use your motorhome all year round without any winter worries.